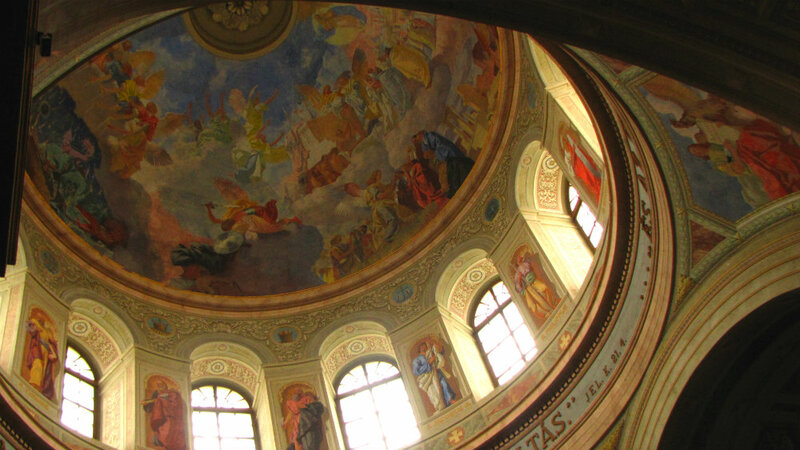 With a castle, basilica, synagogue, thermal baths, a tradition of wine making and even a Valley of Beautiful Women, isn’t it time we put Eger on the itinerary? Stuart Wadsworth is the man behind the words, and lens, in our latest city guide. Hungary, similar to nearby Czech Republic, is a country which is known chiefly for its capital, which dwarfs all other cities in the nation in terms of size and significance. Indeed, a whopping 90% of visitors to the country visit Budapest, leaving only a trickle of tourists elsewhere. Which is a pity, because the rest of the country has much to offer, and Eger – in the (relatively) hilly north of Hungary, a town of some 55,000 – has more to offer than most. A treasure-trove of baroque architecture, cobbled streets and pretty pastel-coloured houses, it is overlooked in a different way by a castle which was used as a bastion against the Turks, as well as several reminders of the 90 years of Turkish occupation including a mosque, minaret and baths – all bequeathed and absorbed into the fabric of the city, giving it a somewhat Mediterranean flavour. The main drawcard of the city however is its wine-making tradition, and its dark red wine, known as ‘Bull’s Blood‘ affectionately by locals and wine connoisseurs alike, is drunk in huge quantities in and around the town. A visit to Eger isn’t complete without a trip to the warren of wine cellars just west of the centre, where generous samples straight from the cask can be had for a handful of Forints. Just don’t lose count of this tricky currency and its confusing notes when you’ve had a few glasses of the stuff. Combine this with a slew of fine dining options – Hungarians are central Europe’s gastronomes – and foodies will not leave Eger disappointed. And when you’re finished wondering the town and its outskirts, you can escape to the Bukk Hills, which rise above the town, and explore some of Hungary’s prettiest countryside and most appealing villages, perhaps pausing for a relaxing thermal bath. Eager yet? In a town the size of Eger, pretty much everything is on the beaten track, although wherever you go you won’t be bothered too much by tourists except at peak times. The most obvious starting point for visitors new to the town is Eger’s castle. Perched atop the town, which is somewhat huddled beneath, it has a proud history, and affords superb views and photographic opportunities. The castle itself is mostly ruins now, but the castle ramparts are quite intact and impressive. There is also an interesting museum where you can glean some information about the 1552 siege of Eger, during which 2,000 soldiers held out bravely against 100,000 Turks (and when Bull’s Blood reputedly got its name), and the 17th century occupation which followed. The Basilica will probably be your second port of call. It’s a real highlight of the town’s amazing architecture – a neoclassical monolith designed in 1836. Its pale yellow dome houses some exquisite works of religious art and stained glass, and is best visited during one of the daily half-hour organ concerts which show off its acoustics to maximum effect. Right under the entrance to the basilica is the City Under the City – the former archbishop’s cellars – and a 45 minute guided tour takes you on a fascinating trip through the history of the town via its caverns. A stroll down Kossuth Lajos Utca is a must; this street is lined with dozens of baroque buildings. The Orthodox Synagogue at No.17 and the former neoclassical synagogue at No.7 remind you of the town’s former Jewish significance (the pre-war Jewish population was 25% of Eger’s total). Other buildings of interest are the County Hall and the rococo Provost’s Palace with its lovely wrought iron gate. Still in the centre, the Lyceum warrants a visit due to the fact that it affords more spectacular views from its 6th floor balcony in addition to a diverting astronomy museum and planetarium with a camera obscura, ‘the eye of Eger’, designed in 1776 to entertain (and spy on) the residents of Eger. Finally, not to be missed is Eger’s somewhat out-of-place minaret – reputedly Europe’s northernmost one – which is 40m tall and topped incongruously by a cross. Claustrophobes will find the 97 step (very) narrow stairway hellish, and those of a larger build should forget it, but the views at the top are stunning. It’s stretching it to call any of the following attractions especially hip, but they are out of the town centre, so may be missed by the casual visitor. First of all, the adjacent sets of baths which are a sure sign of Turkish occupation. Eger’s outdoor thermal baths (Egri Termalfurdo) cost only a handful of Euros and can provide hours of family-friendly fun, whatever the weather. Surrounded by the pleasant Archbishop’s Garden, admission gains you access to a variety of pools, including bubbling massage pools, a kids’ pool and various spa features. Nearby is the indoor Turkish Bath – housed in a building dating from 1617 – where you can soak and relax in several pools, saunas, steam rooms and even a hamam (Turkish bath). Various types of massage and treatments are also available. Ideal after a hard day’s sightseeing and wine-tasting. Speaking of which, the Valley of the Beautiful Women (Szepasszony Volgy – don’t try pronouncing this or any of the names of the places you visit, for this most alien of tongues will almost certainly befuddle you more than the wine) is not to be missed. It may come as a disappointment to some as it is neither a valley as such, nor is it an area notably ripe with heavenly creatures, but to wine connoisseurs at least, it is viticultural nirvana. One of the best places in Hungary to sample wine (together with the Tokaj region), what it does contain is cellar after cellar of locally-produced vintages. Over two dozen pincek (cellars) sell a range of mainly reds such as Bull’s Blood, but also whites such as Olaszrizling and Harslevelu. Cellars 40, 43 and 46 are personal favourites, where service is superb, surrounds atmospheric (if not plush) and wine mostly quaffable and inexpensive – if not world-class. But then, who cares about being a connoisseur? On average, two decilitre glasses cost 200-300 Forints (0.65-0.96 Euro). Hick. For those with a car, touring the nearby Bukk Hills is an absolute pleasure and gives and insight into the culture of the surrounding countryside. Villages such as Szilvasvarad, famous for its Lippizzaner horses, is a pretty place surrounded by slopes of vines producing Bull’s Blood, whilst Repashuta makes an excellent base for exploring nearby caves and the Bukk Plateau. This is also an excellent area to find traditional folk crafts and handiwork such as the colourful local embroidery. Most of your time spent in Eger will involve strolling around and enjoying the many cafes, bars and cellars around the old town, but for a town of its relative obscurity, Eger has a lively cultural life. Predictably, this revolves around wine and the sampling thereof. The main event each year is the Bull’s Blood Festival which takes place in early July. It’s a family-oriented event which has plenty of fun for the little ones as well as providing endless opportunities for adults to imbibe Bull’s Blood, sample local food and listen to Hungarian bands and DJs. 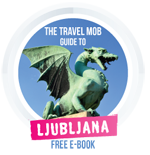 It’s well-attended, so book well ahead, or plan to visit on a day trip from somewhere else such as Budapest. The Egri Street Festival takes place in early May, and focuses on the cuisine of the area, arguably some of Central Europe’s finest, culminating with a large free concert on the Saturday night. Finally, a beer festival happens in August; Hungarian beer is often overlooked by visitors focussed on the wine, but some fine craft beers can be sampled here, from stout darks to cloudy white beers, along with delicious snacks and traditional Hungarian handicrafts. For more on Eger events head here. There are plenty of top-end and mid-range options in Eger; cheap, hostel-type accommodation is scarcer, as the town isn’t really on the backpacker route. That’s not to say it doesn’t exist though, as Imola Hostel proves: at 12 Euro per person it’s the cheapest spot to stay in town and, though its dormitory-style rooms won’t wow, there are perfectly comfortable singles and doubles with bathrooms and shared kitchen. Only slightly pricier, Agria Retur Panzio offers arguably even better value, with cosy rooms in a more family-style lodging near the minaret. There’s a cheery communal eating/kitchen area. Moving upscale, Dobo Vendeghaz, tucked away along one of the town’s pedestrian streets under the castle, is great value at about 40 Euros for a double room. The seven clean and tidy rooms come with all the mod cons and some have a balcony. There’s a pleasant terrace with great views. For those willing to splash out, Hotel Senator Haz offers pretty good value for a boutique hotel at about 70 Euro a room. Location is superb, right on the corner of the main square, whilst atmosphere can be measured in spades, as this 18th century building contains some elegantly-designed and decorated rooms that will impress the most demanding customer. If you want more room, sister property Patria Panzio offers three rooms and two huge apartments for between 70 and 110 Euro. 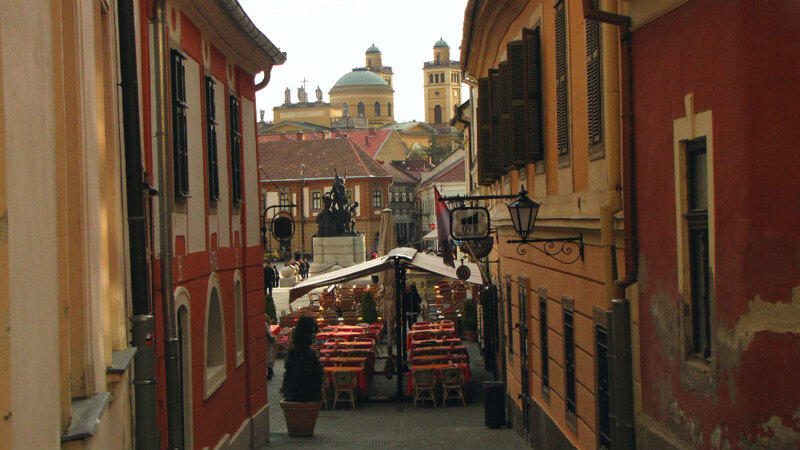 For a town of its size, Eger really punches above its weight, food-wise. There are several really high-quality restaurants which wouldn’t be out of place in Budapest’s competitive streets – at a much friendlier price. All in all, it’s an excellent place to sample good-quality Hungarian cuisine, which, done well, is amongst central Europe’s best. First off is Macok Bistro and Wine Bar. Combining modern Hungarian with European cuisine with a stylish twist, this eatery in the shadow of the castle offers classics like beef cheeks, roasted duck breast or lamb burgers, all at affordable prices and accompanied by fine wine and attentive service. Just off the main square, Senator Haz Etterem provides more high quality at similarly reasonable prices. Its menu has a more international slant but is decidely central European. Try the excellent cream of garlic soup served with Camembert (2 Euros) or the delicious veal stew with potato dumplings (6 Euros). A slightly pricier option is Feherszarvas Vadasztanya which focuses mainly on Hungarian specialities such as game dishes, duck and goose. Cold fruit soups and goose liver pate are particular specialities. If you’re looking for a cheaper option or lunchtime snack, the pancakes at Palacsintavar are excellent. Pop art and quirky antiques decorate the walls, whilst the menu boasts dozens of inventive sweet and savoury pancakes for under 5 Euros. Few people come to Eger expecting to party like it’s 1999, but there are plenty of options for the discerning (wine) drinker and plenty of cute cafes to hang out in. Expect things to wind up by about midnight, or earlier on weekdays. It would be a foolish oversight to miss the afore-mentioned cellars at The Valley of the Beautiful Women, especially on a summer evening. Book a taxi to get back to town as it’s a bit of a walk after a few Bull’s Bloods. 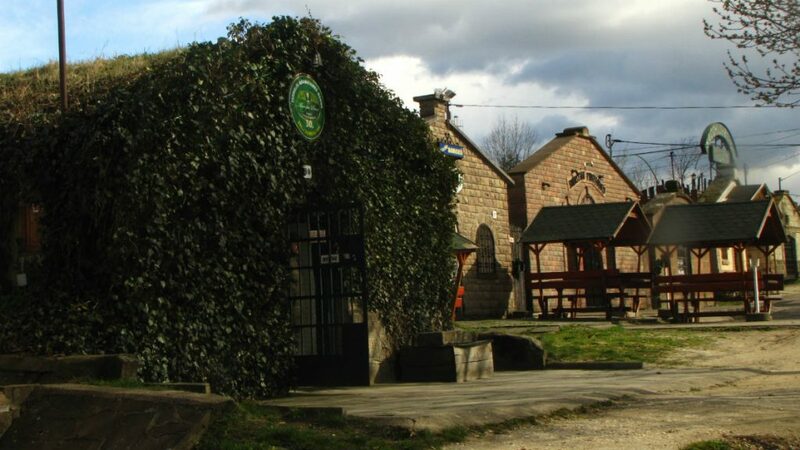 If you are in the centre and prefer something a bit more convivial, Bikaver Borhaz is an excellent place to sample the region’s wines. Its cosy, slightly sozzled atmosphere gives you as good an introduction to Hungarian culture as you will find, and can buy plates of grapes or cheese to cleanse your palate. Another great place to sample wine in a refined atomosphere is Fuzio Wine Bar. 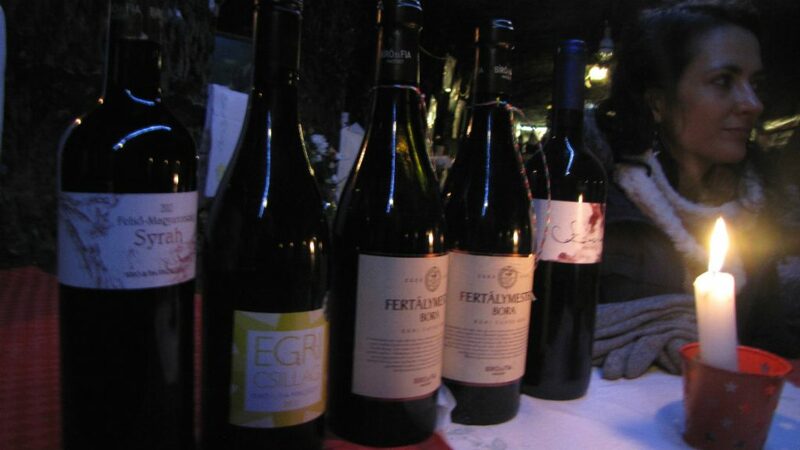 Here, you can order from a list of wines in or do tasting menu which consists of seven types. Spanish tapas and Hungarian snacks are also available. Marjan Cukraszda is a great place for a coffee and pastry in the shadow of the castle. Anyone determined to dance the night away can head to Hippolit, which parties hard to 5am on Wednesdays, Fridays and Saturdays. Eger is likely to be visited by foreign visitors who have flown into Budapest, which is two or three hours away by train or bus. Budapest is one of central Europe’s biggest airport hubs, and is serviced by many budget airlines such as Ryanair and Wizzair, the latter of which is based there. 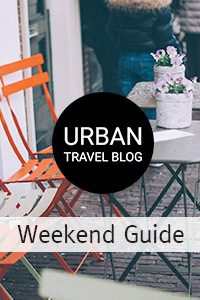 Regular connections make it a viable day trip from the capital, but it would be a pity not to stay here and soak up the atmosphere of the region. Coming from other central European cities, Eger is around eight hours from Krakow and Vienna by train, and twelve from Prague. Road connections through Hungary and surrounding countries are generally good and rarely crowded, making a road trip a viable option. Be aware that vinetta tickets should be purchased at the border if you want to travel on motorways. There’s not a huge amount of stuff online about Eger in English. A decent source of multi-lingual information as to what’s going down in Eger is www.eger.hu – this site has enough enough info for the average visitor to get by on, and includes news about what’s going on in addition to the usual tourist information. Although the Rough Guide to Hungary is sadly now defunct, the Lonely Planet is still going strong and provides a solid hard copy to whatever you want to do in this region. America’s safest travel writer Rick Steves also raves about Eger in his central European guide, though this may appeal more to middle aged or older travellers. For some fiction to accompany you on your stay in Eger, try to pick up a book by its famous resident writer Geza Gardonyi. 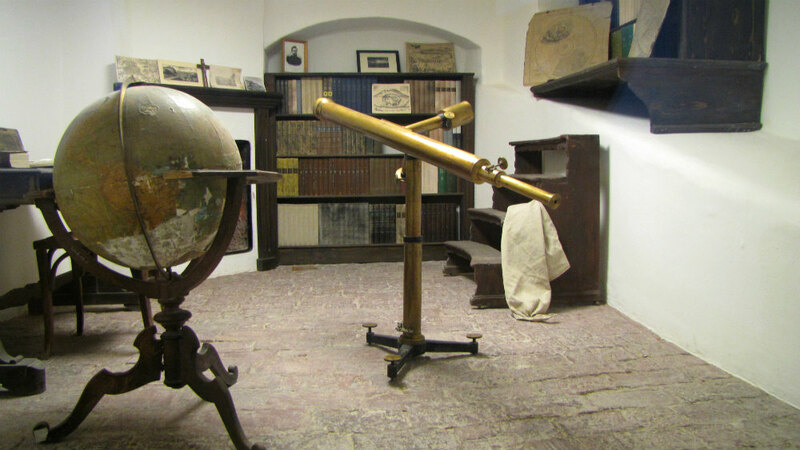 The early 20th century writer, known as ‘the Hermit of Eger’, is known for writing on historical themes and is interested in simple town and village life, giving a flavour of the times. His Stars of Eger (English title: Eclipse of the Crescent Moon) was recently voted one of Hungary’s favourite books. He died in 1922, and his tomb in Eger Castle is a popular pilgrimage site. If you prefer reels to reading, then you could perhaps find a subtitled version of the highly-rated film adaptation of Gardonyi’s favourite work.